Liberal billionaire George Soros is the only individual funding a political action committee established by a coalition of anti-Trump organizations that will target infrequent voters in three battleground states for the November midterm elections, filings show. Soros, who bankrolled lawsuits against voter identification laws and poured money into voter mobilization campaigns during the 2016 elections, has a personal goal of enlarging the electorate by 10 million voters, internal documents from his foundation previously revealed. The Center for Community Change, Planned Parenthood Votes, Color of Change PAC, and Services Employees International Union (SEIU) announced this year that they will target infrequent voters—people of color, young people, and women—in an attempt to push them to the polls. The initiative, called the "Win Justice" campaign, will focus on the battleground states of Florida, Michigan, and Nevada, all which have closely contested Senate races. The coalition plans to reach 2.5 million voters as part of the campaign by using digital organization, training individuals to knock on doors to mobilize voters, and peer-to-peer texting, USA Today reported last month. As part of the initiative, the groups formed the Win Justice PAC, and plan to spend $30 million leading up to the November elections. Soros is the only individual providing funding to the PAC so far. On March 28, Soros cut a $3 million check to the committee, filings show. It is the only reported action from the PAC, as the committee did not mark any disbursements on its April quarterly report. Deepak Pateriya, the chief of staff at the Center for Community Change, one of the group's involved with the campaign, is listed as the PAC's treasurer on its statement of organization. Ryan Young, the director of operations at the Center for Community Change, is the committee's assistant treasurer. Deepak Bhargava, the executive director of the Center for Community Change, sits on the advisory board of Soros's Open Society Foundation. 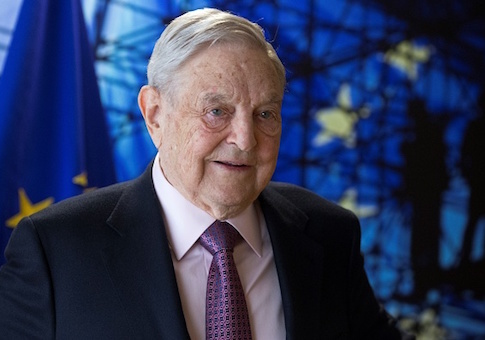 His group, which hides its donors, received $1.75 million from Soros's foundation in 2015, according to unredacted tax forms previously obtained by the Washington Free Beacon. Gara LaMarche, who worked at the Soros Foundation and is the president of the Democracy Alliance, the leftwing dark money donor network cofounded by Soros, sits on the advisory council of the Center for Community Change. The Center for Community Change did not return a request for comment on Soros being the only funder of the PAC to date. Soros's Open Society Foundation also did not provide comment by press time. Soros views voter-related issues as a top priority and set a personal goal of enlarging the electorate by 10 million voters, the Free Beacon previously reported after discovering the memo in a trove of hacked Soros files released by DC Leaks during the 2016 election cycle. The financier has attempted to achieve this goal by pushing funds to a number of voter related initiatives and campaigns that were led by prominent liberal groups and attorneys during the 2016 election cycle. Soros was also the first funder to the Immigrant Voters Win PAC, which was established as part of the "Families Fight Back" campaign in 2016 by immigration activist groups to register Latino voters. Like the current "Win Justice" campaign, Soros initially cut a $3 million check to the PAC. That campaign also involved the Center for Community Change. America's Voice, which fights for "[a] direct, fair and inclusive road to citizenship for immigrants in the U.S. without papers," and the Latino Victory Project, which was founded by actress Eva Longoria and Henry R. Muñoz III, who has chaired the Democratic National Committee's national finance committee since 2013, were also a part of the campaign. Soros additionally funded a multi-million dollar push to combat voter identification laws in a number of states leading up to the 2016 elections. That campaign was led by Marc Elias, a partner at the Washington, D.C., office of the Perkins Coie law firm, who was acting as Hillary Clinton's top campaign lawyer at the time. Elias was filing the suits separate from Hillary's campaign and in his personal capacity as an attorney at Perkins Coie. The Ohio Organizing Collaborative, one of the liberal groups Elias initially included on a lawsuit against Ohio's voter ID laws, later found itself under investigation for submitting fraudulent voter registration forms that included registering dead people to vote. A woman with the group ultimately pled guilty to falsely registering people to vote and was sentenced to six months in prison. Elias joined the board of Priorities USA, the largest liberal Super PAC, in 2017 to lead its efforts against state voting laws. Soros contributed $9.5 million to the PAC throughout the 2016 election cycle and was its most generous donor. Soros's son, Alexander, also gave $1 million to the PAC that cycle. As part of the effort to push back against state voter laws, Priorities absorbed Every Citizen Counts, a nonprofit created by Clinton allies that mobilized Latino and African American voters. This entry was posted in Politics and tagged George Soros. Bookmark the permalink.